King of Kong is a wonderful documentary, but more traditional filmmakers have an eye on it as well. 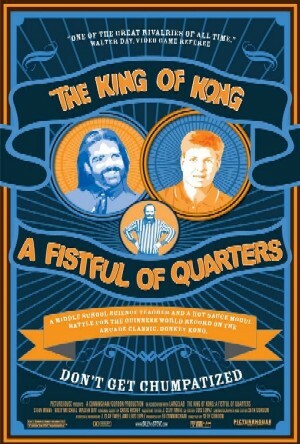 King of Kong: A Fistful of Quarters is easily one of the greatest documentaries of all time, and its popularity led to speculation that it would be adapted into a feature film. According to King of Kong's director Seth Gordon, that film is going to happen and is progressing along nicely. Gordon tells Game Informer: "The adaptation is still in the works at New Line and the script is well on its way." However, Gordon and others do have "concerns" that the documentary's original tale, which wasn't scripted, can be properly expressed through a written narrative. "I feel that the documentary was a really fortunate moment in time where we were able to capture a pretty extraordinary story that unfolded in a way that none of us could have predicted," Gordon says. "How do you adapt that without somehow compromising it?" If you've ever played a videogame with a slight glimmer of enjoyment, you should have watched King of Kong by now. It's the story of a battle for the world record score in Donkey Kong, which is more cutthroat a competition than one might expect. Filled with a lovable cast of characters like everyman Steve Wiebe, his devious nemesis Billy Mitchell, and one aspiring record holder that really wants to share Donkey Kong's "kill screen" with everybody around, it'd be interesting to see how King of Kong translates into a scripted movie. For example, who on the planet would have enough hair power to play Billy Mitchell? And how does one get across the emotion that King of Kong's subjects put into playing a game where a giant ape throws barrels? If anything, the film could have an advantage by revealing more of the story than the documentary could cover. After King of Kong, the Donkey Kong world record switched hands multiple times between Mitchell and a surprise third challenger, before finally ending up back in the hands of Steve Wiebe. I'd like to see another documentary covering an extended tale like this personally, but as Gordon says, he captured a moment in time that can't be replicated, so maybe the upcoming film can still give fans more of what they want in a different way.